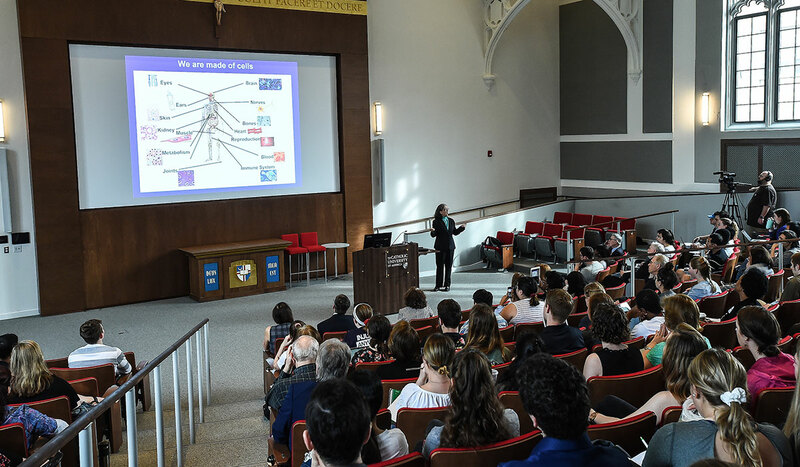 Standing before a large crowd in Maloney Hall’s Della Ratta Auditorium, Biology Associate Professor Ann Corsi shared information about the topic she knows best: the nematodes, or transparent roundworms, that she uses to research human craniofacial diseases. For most of her career, Corsi has been studying the ways the Twist protein controls gene expression in a kind of transparent nematode known as C.elegans, in order to better understand how the same protein can contribute to skull deformations in human infants. “Even though C. elegans bears no resemblance to humans at all, the process of development has a lot of features that allow scientists to gain insights into human biology,” Corsi said. 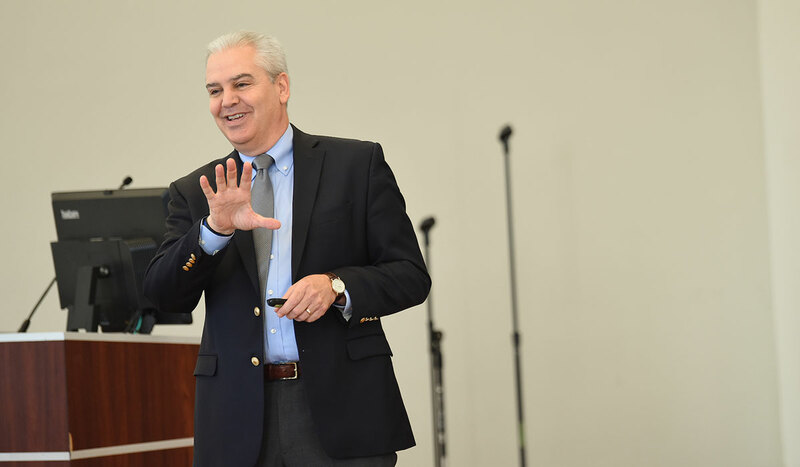 Corsi’s presentation was the keynote address for Catholic University’s 2019 Research Day, which took place on April 9. 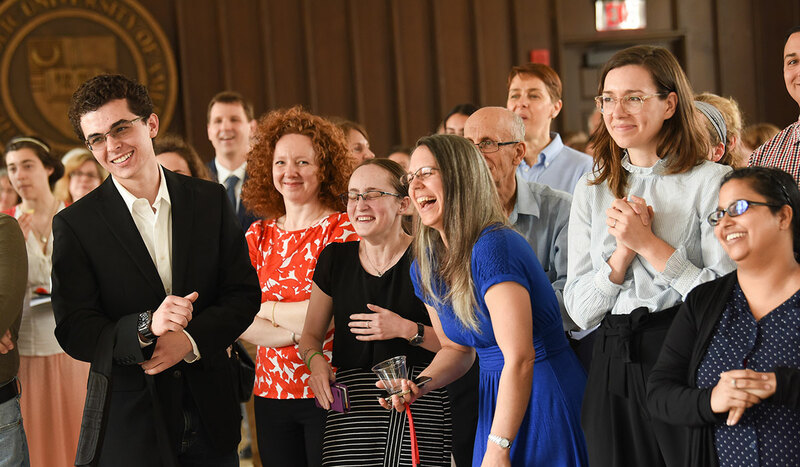 The annual event, which was founded four years ago, is intended to highlight the diverse research work of the entire University community. 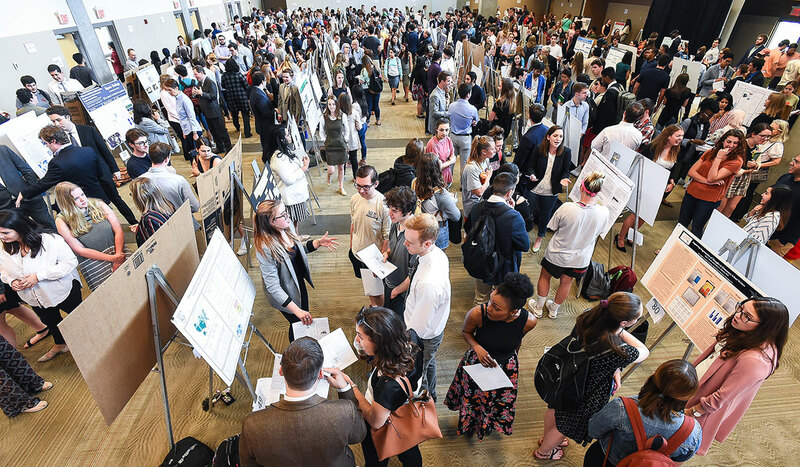 This year’s Research Day marked the largest turnout and participation in the event’s history, with a record 358 submitted proposals, 85 oral presentations and 149 posters. The day began with an opening address from University President John Garvey, who referred to the words of Saint John Paul II, who visited the Catholic University campus in 1979 and encouraged students to research “the topics that trouble them … in the light of Christ.” Students are able to blend research and service, Garvey said, by tackling current challenges facing the Church, the nation, and the world. 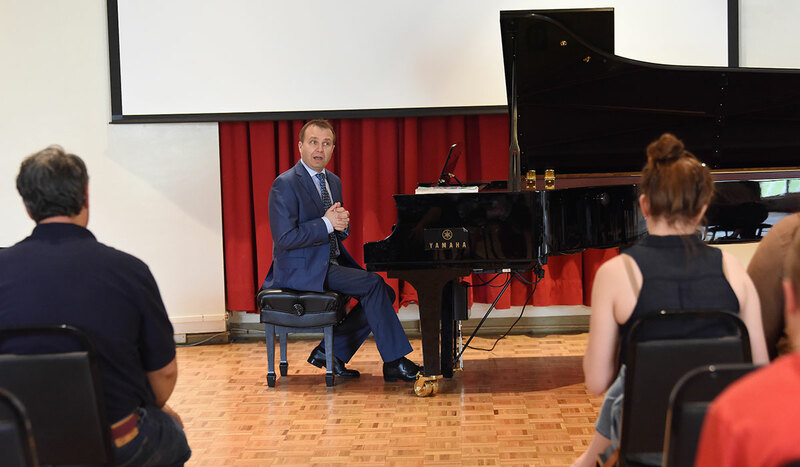 “Research Day is a testament to the extent of creativity and the variety of the research that goes on here,” he said. 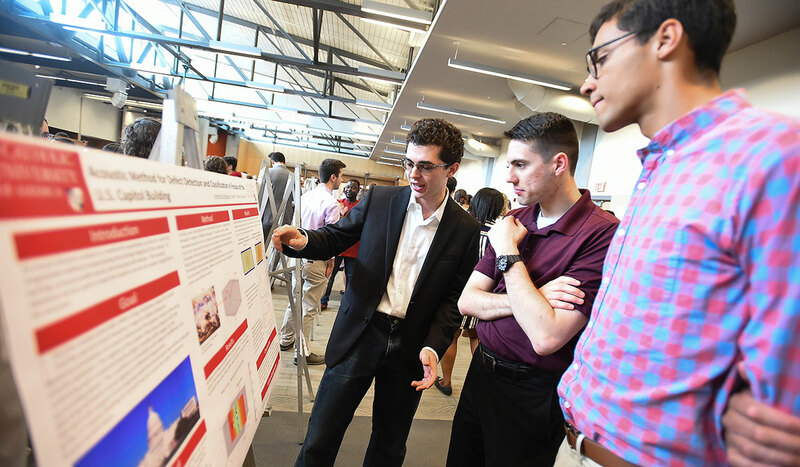 Classes were cancelled for the day, so that students and faculty members could present their research throughout campus. 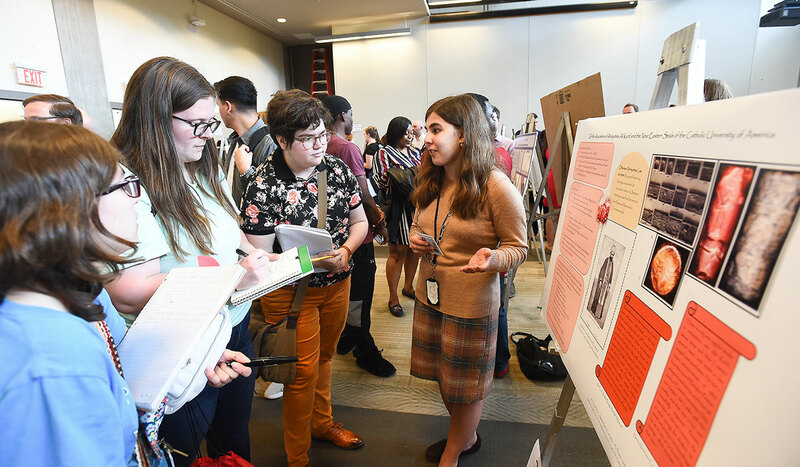 Topics discussed during the oral presentations varied widely, covering subjects as diverse as Armenian mythology, Baltimore food deserts, big data, and yeast genetics. 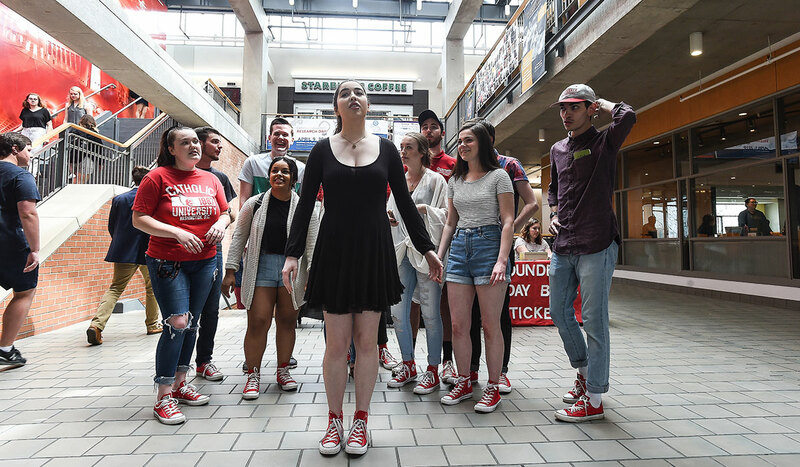 After lunch, students lined the Pryzbyla Center with research posters, as well as interactive displays of musical and dramatic performances and virtual reality demonstrations. 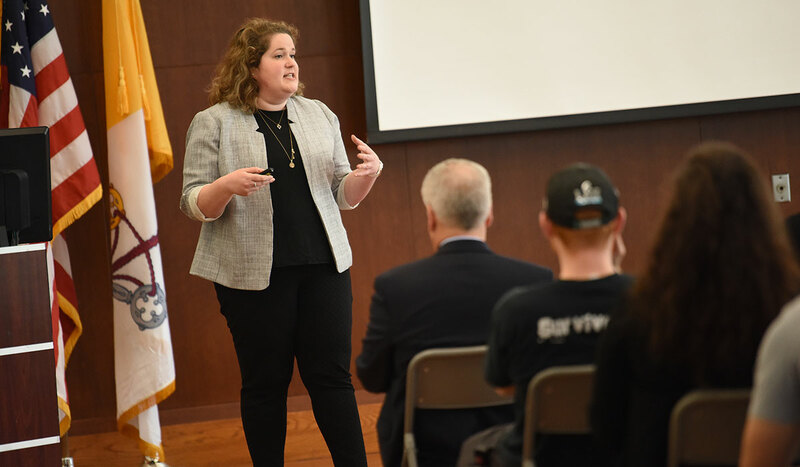 Rebecca Deverter, a law school student, shared her research on human rights violations in North Korea during a morning oral presentation session in Caldwell Auditorium. “For years, North Korea has been denying the fact that there’s a grave human rights issue occuring in the country, by not providing enough detail about their prison systems,” she said, before explaining that an estimated 80,000 to 120,000 North Korean citizens are being held in prison camps, where they face brutality, starvation, and forced labor. 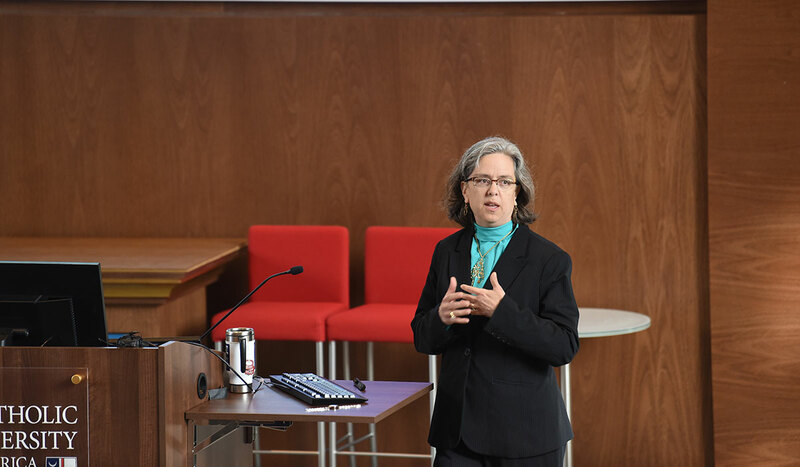 Deverter, who has a master's degree in international affairs, said she began researching her topic as part of a human trafficking seminar class taught by law professor Mary Leary. 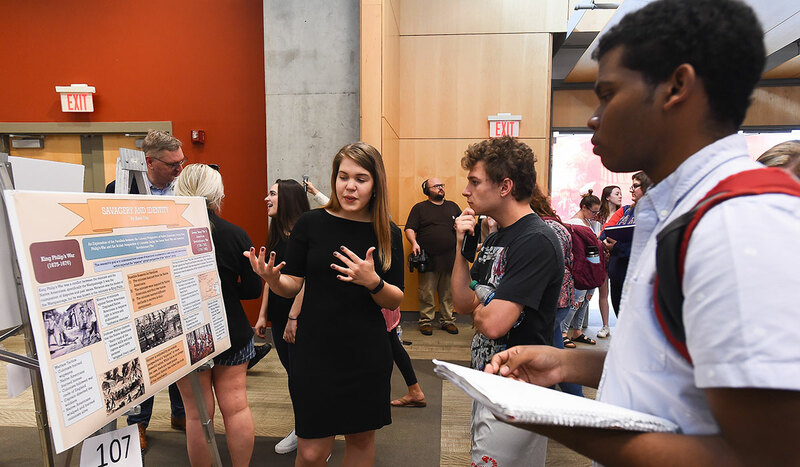 Senior Ashley Richard presented for the second year in a row, with her oral presentation about St. Óscar Romero’s role in the Salvadoran Civil War. 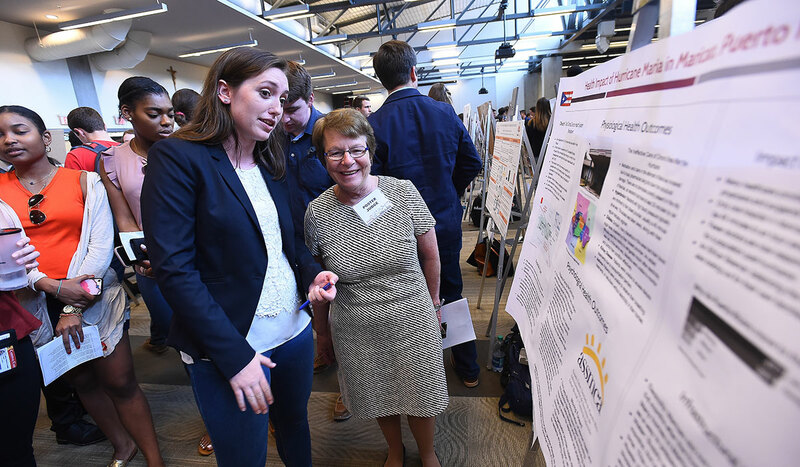 Last year, Richard, a Spanish and biology double major, presented a poster of her lab research explaining the effects of alcohol on liver function. 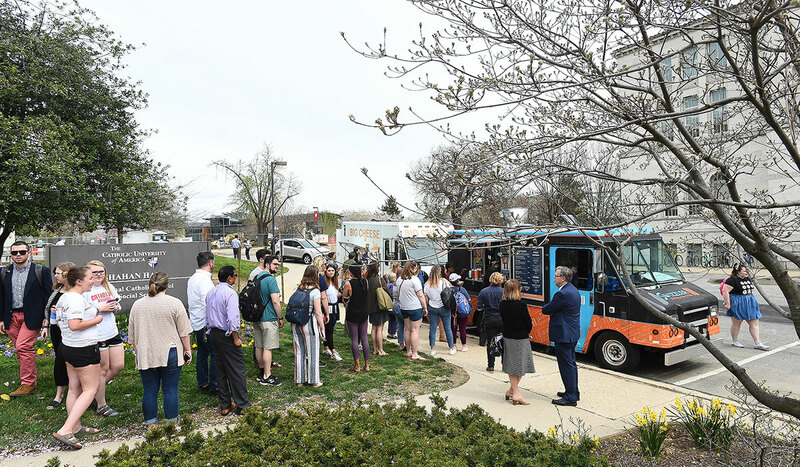 “This was a really radical shift, but I was able to take what I learned from my research experience as a biology student and apply it to my Spanish degree and my senior thesis on this topic,” she said. Richard was inspired to study the life of Romero because of her own experiences doing mission work and studying abroad in Latin America, where his image is often seen. 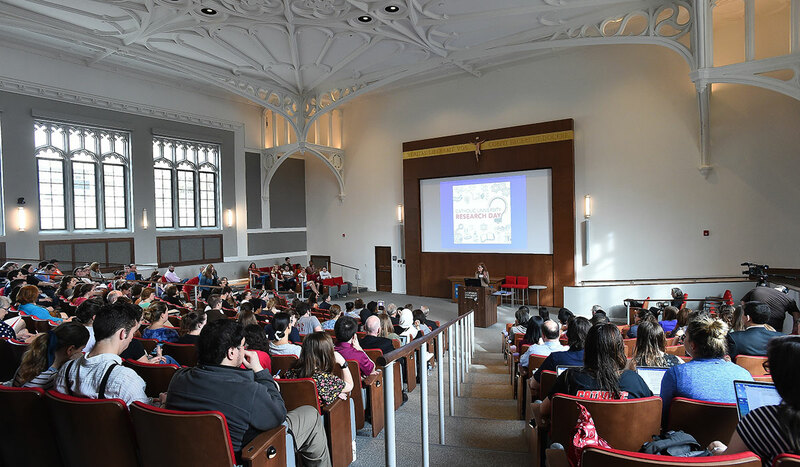 She enjoyed being able to share what she has learned, in the hopes that her presentation will inspire others to learn more about the newly canonized saint. 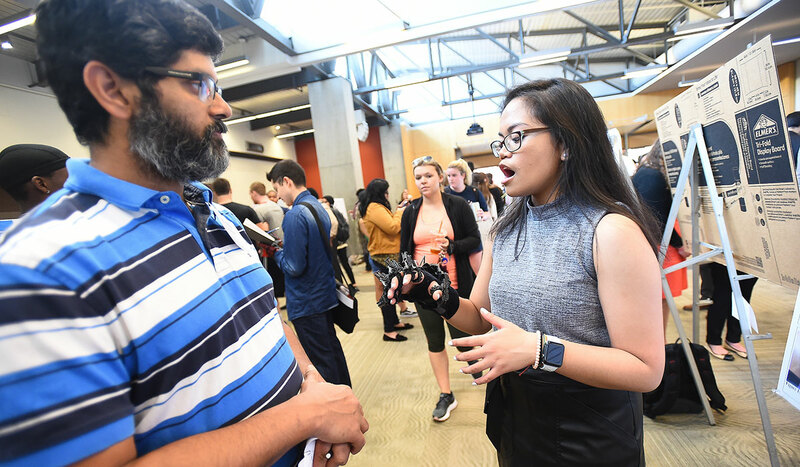 “Research Day is an opportunity to spark ideas and to kind of ignite this fire and inspire other people to pursue research as well,” she said. “I can’t even cover a small sliver of the life of Óscar Romero, but if people are hearing about him for the first time, then they can go home and do research on him themselves and then going deeper into that, find more research questions to study on their own. —Katie Bahr, Assistant Director of Communications and Media Relations. Bahr can be reached at bahr@catholic.edu. 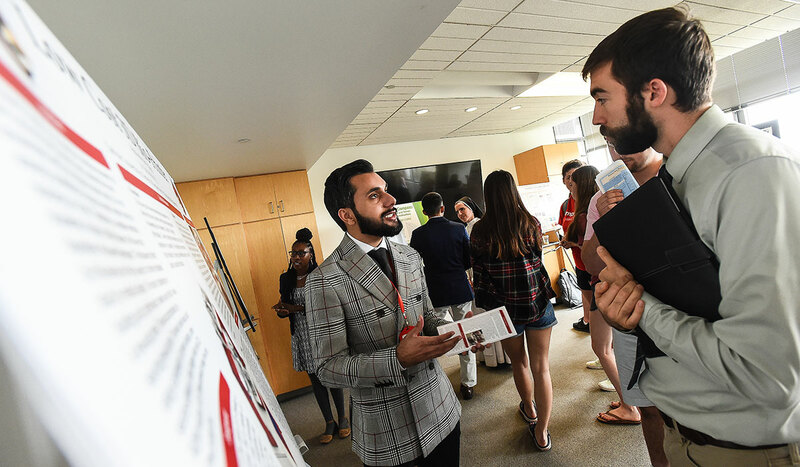 About 15 minutes before Research Day officially began, I, like many of my fellow presenters, found my assigned spot on the third floor of the Pryz, and hung up my poster board. 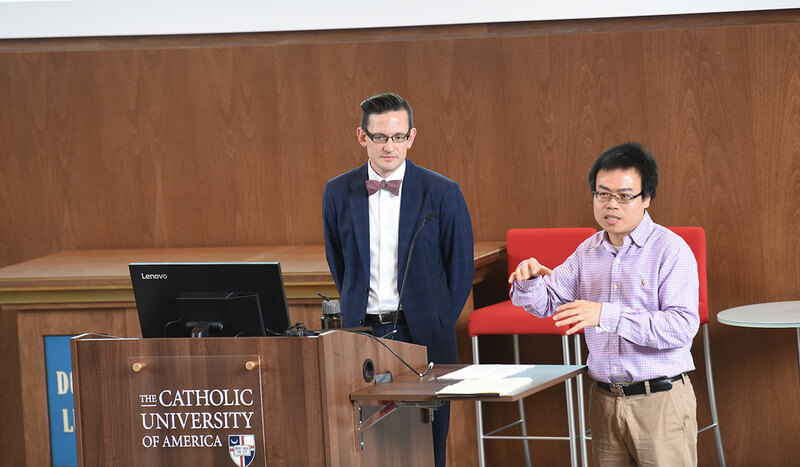 My presentation examining the media and its relationship to the environment was situated between a biomedical engineering student’s plans for a 3D bioprinter and a Dominican Sister presenting on geometric constructions dating back to ancient times. 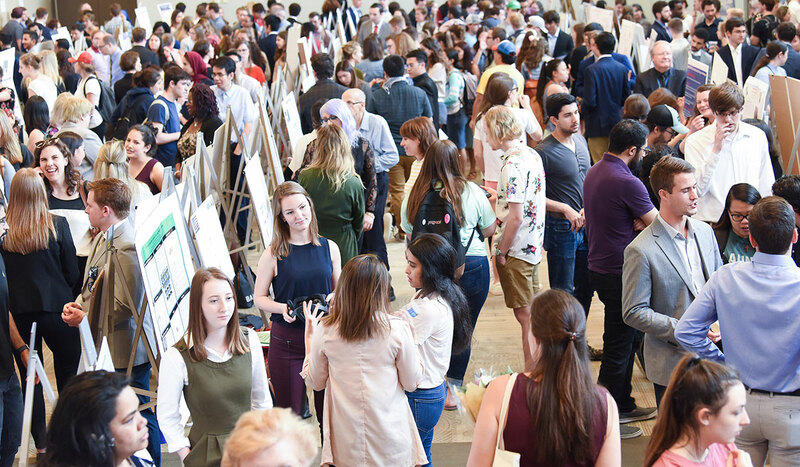 Looking around the room in that moment, I felt like I understood the true spirit and purpose of Research Day. When I was in the media lab in Crough, digging through advertisements and analyzing how companies were commodifying the environment for commercial gain, I wasn’t thinking about the engineers just a stone’s throw away in Pangborn Hall, who were also working tirelessly on their own presentations. The unique experience of Research Day is not lost on anyone. It is not everyday that you find yourself explaining common rhetorical techniques in advertising to your theology professor, your roommate, and a community director all at the same time, but there I was. 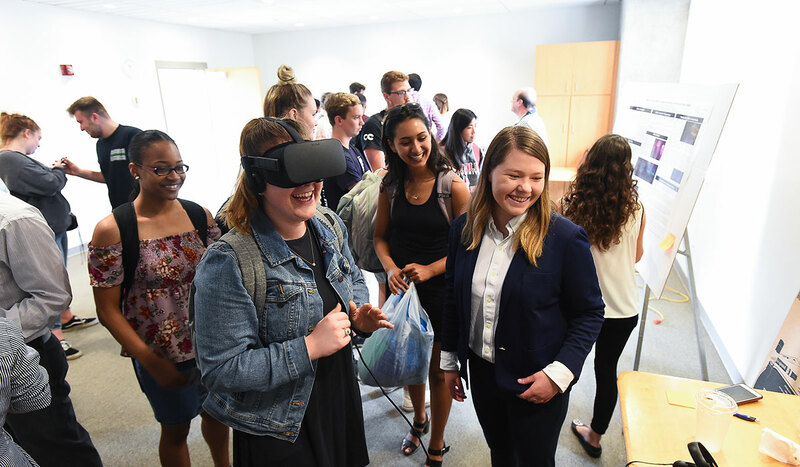 The goal of my project was to give everyone a foundation for media literacy in their daily lives, and getting to hear the responses and unique takeaways that those who visited my board had, made it feel like there was a real-life importance and connection to what we do at Research Day. 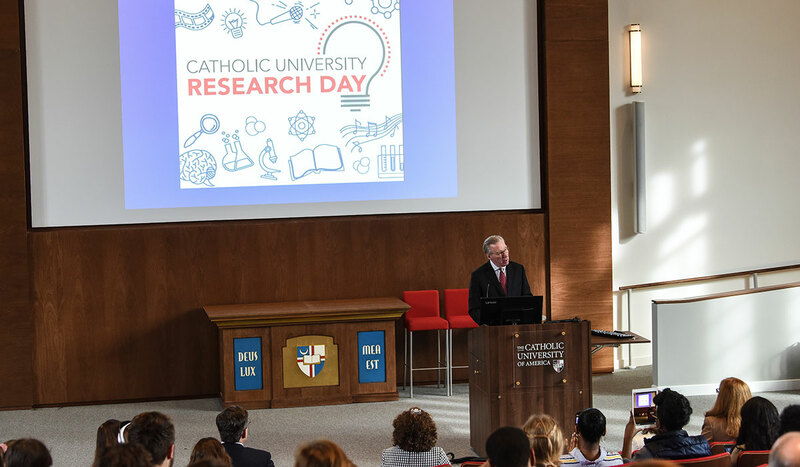 Research Day is the event at the University that brings us all together and puts on display the wide variety of work being done at Catholic University. 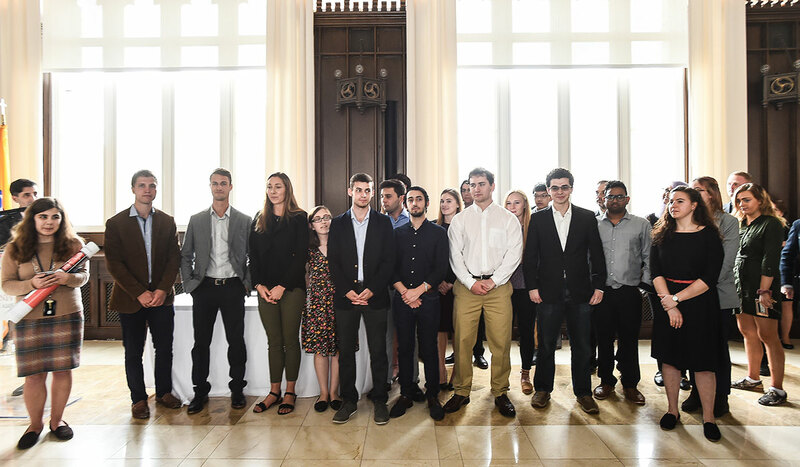 I felt a tremendous sense of pride not only in getting to display work from the disciplines in which I thrive, but also that I am surrounded by peers who are striving in their own respective fields. It is rare to be in a room celebrating research that is so multifaceted.